I was back to my normal classes today. As much as the younger years are adorable and it was really nice having a Thai speaker leading the lesson, I did slightly miss my own classes. I must have been quite excited to see them again because I woke up around 6am and decided to get in the shower and not stay in bed any longer. I got ready so quickly that I even gave our room a thorough sweep so that it was clean before we left for the weekend! But I still thought it wise to have my can of Fanta before my G.12 lesson. I stuck it in the fridge the night before and it was great having a cold drink in the stuffy staff room. In my first lesson the G.12s didn’t seem to share my enthusiasm to be back at lessons. It took a lot just to persuade any of the students to write the names of celebrities on the board. In the end I started writing up my suggestions and the students called out some names. At least they were putting some effort in! I then got them to choose their favourite celebrity and to describe their appearance. It was great to see all the class got stuck into this task. I think they actually enjoyed it. I then asked some students to read out their descriptions towards the end of the lesson. I used their descriptions as instructions to draw their celebrity. This was good because it meant they needed to tell me exactly what they’re face shape was, if their chin or nose was pointed, their eyebrows were bushy and so on. I only had time to hear three descriptions, but I think I will try to hear more next lesson on Monday. For my next class they were also very tired but were noisier than G.12. Thankfully Poom from my G.11 class and a teacher were there to help shush and explain some of the lesson to my G.10 lesson. One of the activities I did in the lesson that did need explaining was when I picked students (one from each team) to read out a phrase and their team had to guess what type of occupation would say that. For example ‘Can I take your order sir?’ would be said by a waiter or waitress. This was good because I could pick students who don’t usually speak in lessons to read and talk, and encourage them too. I might try and adapt this game to other topics as well. After telling Ben we were leaving for Khon Kaen that evening, he suggested that we leave the office early to make sure we were packed and could leave quickly so we wouldn’t miss the bus. This was great as the others had not been feeling well the day before and were still recovering – as well as doing a bit of packing. Once 4pm came I left the office, showered and finished packing. The taxi took us to the bus station at 4.30pm and we got to the bus terminal by 5.15pm. All was going well; too well. We asked one of the bus terminal staff to show us where to get tickets to Khon Kaen. The last bus was soon so we needed to buy tickets and dinner, so there was a need to rush. But when we reached the box office to buy the tickets, we were told that the last bus was full! We didn’t know what to do. We had booked our rooms in Khon Kaen for that night. The woman suggested that we catch a bus to Sarakham instead and then get a bus to Khon Kaen, as they went every hour. This sounded like a better solution than sulking back to our rooms at the school. And we’ll get to see another city. What could go wrong? We all managed to get some form of dinner before we boarded the bus. While the others got snacks, I decided to be adventurous and buy something cooked at one of the stalls. As much as it took five minutes to make and I had to eat it on the bus, it meant that I had a proper meal for the trip. 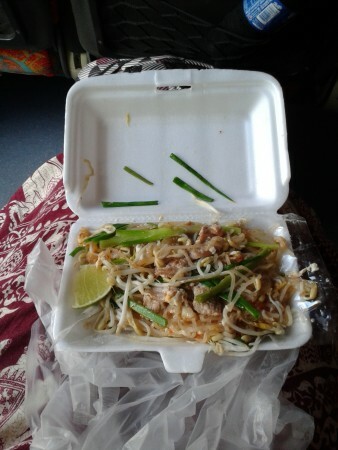 And despite having to use chopsticks, the Pad Thai was definitely worth trying. A few hours into the journey I shifted to sit next to Kate. This did cause a bit of an issue though. I’m not entirely sure, but from the looks the bus stewardess gave me, I could tell at that point that you weren’t meant to change seats. No matter what the box office staff told us. But we were comfy and were only on until Sarakham, so it did not matter. Although now we thought about it, we weren’t quite sure where Sarakham was or, at the time, how it was spelt or even said. So Kate called Aum to see if he could google the place and see if it really was on the way to Khon Kaen. He however had never heard of it, no matter how many times I repeated it as loudly as I could on a dark bus with many people trying to sleep. So we texted him how we thought it was spelt. But after we sent the message, we realised we had spelt out the name of our mentor instead (Ben’s real name is Sarayut). Aum had googled it by the time we realised and called him. He revealed that Sarayut is also the name of a pregnancy clinic and was quite confused and concerned to find out we were going there. Needless to say we were trying to stifle our laughter on the dark and quiet bus. Kate gave up and told him that we would call him when we got to Sarakham, where ever it was. We finally arrived at Sarakham around 9.30pm, to find out that we had missed the last bus by about an hour. I tried to find out when the buses were the next day from the bus terminal attendant. All I got from him was 6am, until a kind woman came over and asked to translate for me. Thankfully there were buses later than 6am. They were on every hour from 6am. Now that was sorted we just had to find a hotel. There wasn’t any free wifi at the bus terminal, so the woman who translated for me let me look at hostels on her phone. She offered to take us to a hostel nearby as her father was picking her up. I think we were all tired beyond the point of caring and just wanted a bed, so we agreed and squeezed four of us in the back of her father’s jeep. We came to a hotel called Green Park and she offered to check the price of the rooms. By this point we were already out of the car and couldn’t care about the price, so long as they had a room. Thankfully they did and for a reasonable price too. So we thanked the wonderfully kind woman and her father and traipsed off to our rooms – Hannah and I in one, Eilidh and Kate in another. After establishing that the showers were hot and the wifi was terrible, we fell asleep very quickly. I think it was the best sleep I had enjoyed in a while.